Searing temperatures and a bone dry atmosphere – the summer of 2018 in Europe was intense. There are, however, countries, where drought is normal. Morocco, for instance. Because of climate change, it has now become so hot and dry there that what little water there is has become very scarce indeed. 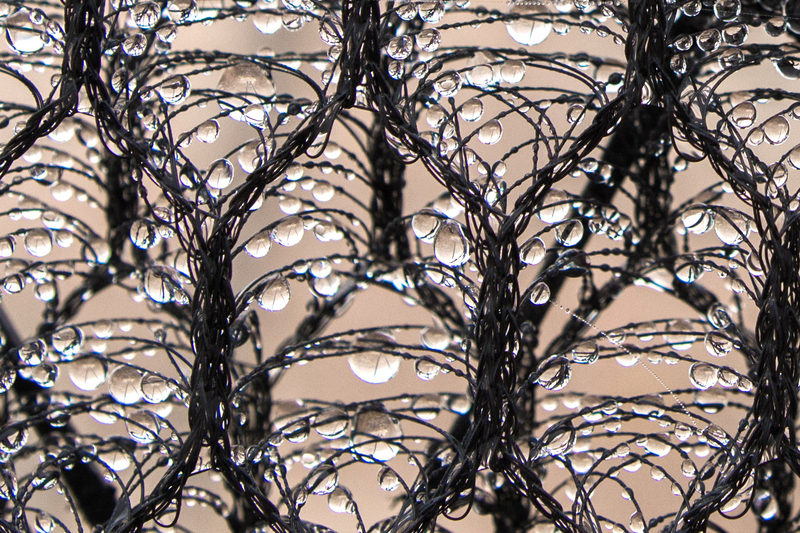 As a result, textile netting is now being used to ‘harvest’ water from mist and fog. “It hasn’t rained here for a year,” says Peter Trautwein, from the Munich-based company Aqualonis GmbH, speaking of the region around the South Moroccan port Sidi Ifni. The people there are used to very hot, dry summers. But climate change has been increasingly dipping its finger – or rather its claws – in the pie! The result is unrelenting periods of drought with temperatures of up to 50 degrees Celsius, dramatic storms and a life-threatening dearth of water. “For a country, that lives principally from its agriculture, it is disastrous,” says Trautwein. And the demographic change adds additional burdens on water stocks, too; since 1961, the population has almost trebled from 12.7 to 35.7 million. The situation in remote mountain areas is particularly dramatic. People often have to walk miles to the nearest water source; water from mobile trucks is expensive. So, too, in the area around Mount Boutmezguida. Which is why, in conjunction with several partners, Trautwein, the development officer for the ‘Water Foundation’ project, is currently installing a ‘water-harvesting’ farm made of textile. The ‘CloudFisher’ which is reminiscent of a string of volleyball nets, is made up of fine fibre structures and is intended to ‘catch’ fresh water from the banks of fog that draw in from the sea. The water gained in this way drips into collector channels and flows into cisterns. The ‘harvest’ from the wafting banks of cloud is expected to provide around 1,150 people from 15 villages with up to 30 litres of water per person per day. This sounds a lot but is, at the same time, very little: a lot, because people in the region have, in the past, had to make do with only up to eight litres a day; but very little, when you consider that the average per-capita water usage in Germany alone amounts to around 122 litres a day. 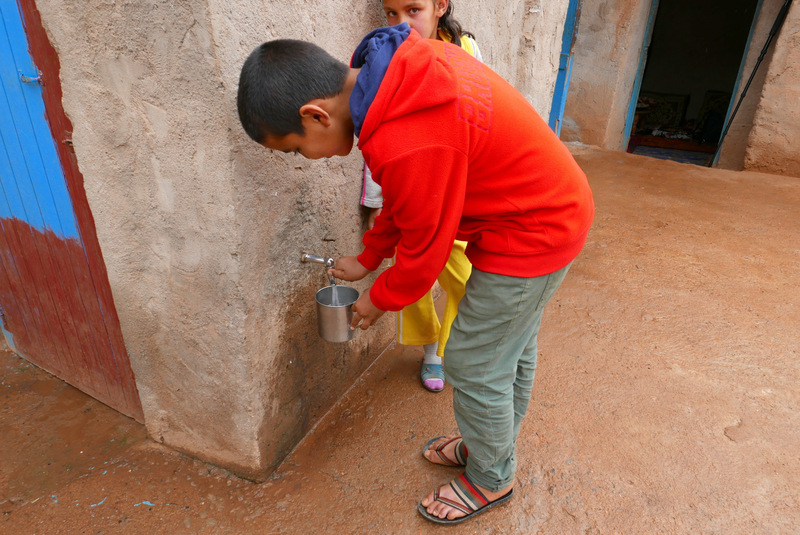 Drinking water from fog: children like Hisham Hamou Ali (red jumper) are the ones to benefit from the water harvested from the floating clouds. Life flows drop by drop: in this close-up, the fine droplets of water can be clearly seen along the complex structure formed by the man-made fibres. The fog harvester could not have been built without the help of German Federal Ministry of Development who contributed € 500,000 in support of the project: the Munich Re Foundation Stiftung and the DVGW (German Technical and Scientific Association for Gas and Water) also provided finances. “There are requests for fog harvesters on our desk from Tanzania, Iran and South Africa, but we have to find the money for everything,” says Trautwein. “So we are delighted to receive every donation.” According to the United Nations Children’s Fund (UNICEF), and the World Health Organisation (WHO), over 600 million people worldwide have no access to clean drinking water. Further information about the “CloudFisher” and textile, fog-harvesting projects is available here and here. ← What became of …?